Just what is going on at the BBC – two articles on herbs in two days! 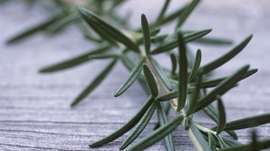 Today’s article on their website relates to rosemary essential oil and its effect on memory. It’s most intriguing, and encouraging, to read the final quote especially: “We have spent many years rubbishing alternative treatments but there is, I believe, a real benefit in allowing people to take control of their own health with treatments that make them feel better – even if we haven’t been able to prove how.” Hear Hear!